I’m finishing up a mini campaign setting for a Santicore present. It’s taking some time because I’m basing it on a real, still existing culture and I could easily screw it up. I’ve been through many drafts and have decided to sneak past the dragon of perfect wordsmithing but I still face the owlbear of giving it the right amount of detail and the slaad of making sure it’s worth playing. I’ll post it here and at the Santicore blog. After that, there will be many requests to fulfill here on this blog. Luckily, none of them are mini campaign settings. I am not often moved to review modules because I think there are far more well-read bloggers out there who do review things and a lot of what is published is not to my personal taste and therefore better addressed by someone else. 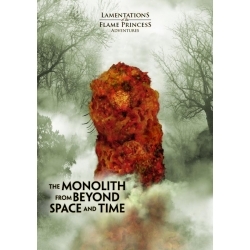 But every once in awhile something comes along that makes me say “Damn, I really wish I’d made that.” The Monolith from Beyond Space and Time, an adventure by James Raggi IV and published by his company Lamentations of the Flame Princess, is one of those things. I backed this in its indie-gogo campaign earlier this year and was both nervous and excited to see the payoff. It became available as a pdf this morning. To start, you have to get the party to explore a mysterious valley. Caravans have disappeared, adventurers are missing, locals say there’s something fishy… whatever reason. And the players willingly step into the quicksand, perhaps expecting the usual wilderness hex crawl. What they get combines the weirdness of LOST with the ominous tone of 2001. This adventure reminds me most of the painting in the cabin in Death Frost Doom. That was a set piece that defied player’s expectations of what could happen in a game. When I ran it a few summers back, the players spent a good half hour trying to figure out if it was safe to touch, was magic, an illusion or sellable. It was, for me, the highlight of the afternoon because the grizzled vets of the New York Red Box looked stumped. But that was on a small scale. Monolith is packed with situations that defy players’ expectations but with far greater consequences. I can’t give any for-instances without spoiling, but I can tell you some of this stuff is just brutal and mind-bending and the sort of thing that, as a GM, you would WANT to see happen because it would be so damn cool to see the looks on the players faces when they happen. I don’t mean insta-death stuff. This isn’t a death trap, necessarily. And luckily, there’s enough of these crazy things where at least some of them have to happen. This is one of those adventures that, as a GM, you want to run right away, but you have to already have a campaign going. I don’t think it makes sense as a one-shot. I think it really needs to be run in an established campaign. If you run it in the beginning of a campaign, it would be hard to top later on. If you run it as a one-shot, the life and game-altering effects of the adventure would be lost if your characters have no future. It’s one of those adventures your players will talk about for years. Magic users have a fetish for hats. With all that chaos gas in your head, you’d wear one too, lest the sun cause your head to explode! As I posted previously, magic users (I will use the shorter “mages” from this point on) are outcasts, victims of a memetic disease that has caused chaotic energy to build up in their brain. Their only relief is casting spells, which release that energy, and they all crave new formulae to recite to get that release. Since spell research is a lost art, they search the world for rare spells or resort to cannibalism to gain their rival’s knowledge. All this while avoiding the wrath of organized churches, zealous clerics and superstitious villagers. What are mages like, then? Any mage who has lasted longer than a few years has learned how to pass for normal when required. They pick up on local customs, details, clothing trends and accents. In LotFP terms, they would all have at least a 2 in 6 skill at disguise and mimic. A lone mage is a rare mage, but they do exist. Most mages seek out their own kind for mutual protection. A dozen first level mages will stand stronger against a mob of villagers much better than one. Some mage communities also have real-world occupations such as caravans, acting troupes or mercenaries. There are many that do not try to pass for anything but what they are. They live in borderlands, travel at night and generally try not to bring the wrath of the local lord upon them. Many of these are extended families or clans, who pass on the curse to their children. Mage communities are both rivals and codependents. They might war against one another for years yet observe a truce during large gatherings. They identify their clan or lineage by their dress, which is usually expressed as a choice of hat or decoration thereof. In western Europe-themed games, mages share a common set of customs that have been passed down ‘because’. A fleeing mage is entitled to sanctuary from pursuing non-mages if he asks for it. He must leave once the danger has passed and his safety is guaranteed for two days. If he stays past the day the danger has passed, he does so of his own will and his safety is not assured. If the leader of a community offers hospitality, however, a visiting mage may not be harmed under any circumstances while that leader is still in charge. A mage is not obligated to go out of his way to rescue another mage or to block pursuers. If a mage saves another’s life, the rescued mage owes him a brain-debt, which means the rescuer is entitled to his brains should he die before they part company. Some interpret this as a right to rescue then eat another mage’s brains right away. Magic communities have their own courts and codes of behavior. It is important for a visiting mage to learn the local rules, especially when it comes to casting and duel etiquette. In some communities, teaching someone a spell is the equivalent of marrying them. So watch out how you interact with the locals. Mages often introduce themselves to one another by repeating the phrase of the read magic spell they first learned. Often this becomes a special name used among other mages and which regular folk cannot pronouce or understand. If a mage wants to impress, she might list certain spells she knows (which reveals ‘level’ and therefore status). Mages also like to point out identifying characteristics of their hats. I am Sakura, also known by the seed syllables ‘marak-tah-lem’. I am a master of the ball of fire that reduces my enemies and their kin to ashes! You will notice my red turban, which is the customary hat of my people, who hail from across the Kraken’s sea. It has a blue jewel in the center, which represents my having attained the sixth level of mental calm and focus. The observant will also know me by how tightly it is wrapped, which is necessary to contain the power within my skull. Should you ever try to unwrap it and cut your way to my brains, you would find scorpions and many other surprises between its folds! Which brings us to hats. Most people in the world wear hats, but mages wear HATS. The more outlandish, the better. The more foreign, the better. Hats are used to signify attainment, identify clan or community membership, hold spell components, small items and even traps for the unwary. A hatless mage is a vulnerable mage. Two mages removing their hats to one another is an act of intimacy, either friendly or romantic. It signifies deep trust. Tipping the hat is a way of showing deep respect. Touching a single finger to the hat is a common way to greet another mage for the first time. It is a symbolic tipping of the hat and denotes polite respect. Mages who must pass in civilization have more modest hats, usually following the local style (although they will be as nice as the mage can afford and perhaps a bit ostentatious). These normal hats are scorned by the magic communities of the borderlands as ‘small hats’. Bareheads have managed to grow gravity-defying hair that can also be used for storage. Wigheads wear white wigs in the local fashion and use their wigs as others use their hats. So here’s some stuff you can use to make magic users more interesting. Some of this stuff is an elaboration on others’ ideas (“Brains” for example). These can be applied to many first-edition games. Its origin is lost to time. Its study crumbled with empires past. But the mantra that opens the door of chaos in the mind survives. Called the ‘first spell’, by those who repeat it, the mantra pulls chaotic vapors from space and fill the mind of someone who hears it. The pressure from these vapors must be released and the only safe way is through repeating the first spell or other spells that were preserved through oral tradition or discovered in ruined libraries. You somehow heard this first spell and its song was stuck in your head. Now you spend your days mumbling to yourself as you search the world for new spells to clear the vapors from your skull. Magic Users can detect magic in the immediate area by concentrating for 1 minute and sniffing, listening and looking. Magic can be detected on a specific item or person only by touch. The brain of a magic user contains all the memorized spells that are ready to cast. If the magic user is killed by a blow to the head, there is a 50 percent chance for each spell that it will go off on the spot. If the spell requires a target, a random bystander is the target. If it requires touch, then consider any loose brain matter to be a touch. If a magic user is killed but the head is undamaged, his or her brains can be eaten by another magic user, who permanently learns any spell of the levels he or she can cast. Any spells above allowed levels can be cast once, as per a scroll, but cannot be memorized for later use. A magic user’s brain can be dried out and used by anyone as a ‘spell grenade’ or ground into a powder and mixed with wine as a potion of that spell. The art of creating new spells was lost millenia ago. There are a few hundred known spells and variations on spells. All of them were found in libraries, caves, old books, etched in the skin of snakes and in the songs of rare birds. Unearthing a new spell is, therefore, a major accomplishment for a magic user and something that will forment both admiration and jealousy in his peers. The newfound spell is usually named in honor of its discover, even if his peers futher honor him by hunting him for his brain. Spells can be written into books and scrolls using any alphabet. A spellbook can be a normal book, a painting, a tattoo, etched on the skin of a familiar or written in tiny letters on an everyday object. A magic user never reveals to anyone what his book is unless absolutely necessary. When a spell is written on a scroll, any magic user can copy it into her book or it can be cast, even if it is on a spell level higher than allowed for that character. Any other class can also cast a spell from a scroll, but there is a 20 percent chance of backfiring (roll on a mishaps table) and a 20 percent chance per level that the character will be infected with the magic meme and become a magic user permenantly. GMs can decide to switch the player’s class on the spot, secretly or give the option of declaring the character an insane NPC. Magic Users re-memorize their spells on a daily basis. Some do so by studying their spell book in private. Others might hum a cycle of tunes strumming an instrument. In all cases, they need uninterrupted time. Spell components are things such as berries, grasses, liquids, small items of various sorts that can be used to supplement the power of a spell. They are consumed in the casting. The magic user is entitled to an OPTIONAL second roll for damage, to hit, on a table and so forth if she doesn’t like how the first one turned out. There is no guarantee the second roll will be better, but it becomes the official roll if the first is not taken. Lists of components and the spells they compliment are almost as sought after as undiscovered spells. Magic Users have a chaos number. It starts at 0 when they begin as 1st level. Whenever they cast a spell, their chaos number goes up by the level number of the spell. A magic missile spell is a first level spell, so that would raise the number by 1. This number continues to go up as he casts spells until there is a chaos effect. Every time a Magic User rests to study and relearn his spells, he must roll a d100. If the result is under his chaos number, there is a chaos effect. If there is a chaos effect, the player rolls 1d10 and adds that to his chaos number. He tells the GM the resulting number. The mage’s chaos number is reset to 0. (I will post some examples of chaos number tables soon). Magic users have been hunted for centuries in most parts of the world. They live as outcasts either alone or in travelling communities. They have their own customs and laws (or at least expectations). Most magic users travel incognito when in civilized lands. For the purposes of adventuring, clerics and mages are usually at odds but for the purposes of having an enjoyable night of gaming should not be directly at one another’s throats or extorting one another for healing or help.